Small firms are largely unaware of the potential effects of having an online health insurance exchange likely operate in their state come 2014. NEW YORK ( MainStreet) -- When it comes to health care reform, small firms are largely unaware of the potential benefits, according to a survey released Wednesday by eHealth ( EHTH - Get Report), the parent company to eHealthInsurance. Not knowing the effects of having an online health insurance exchange in their state come 2014 means most firms aren't making any changes or long-term plans regarding their employee health insurance coverage, the survey shows. Beginning in 2014, the Patient Protection and Affordable Care Act of 2010 requires businesses with 50 or more full-time employees to provide health insurance coverage for their workers. Businesses with fewer than 50 employees are exempt, although employees may be required to buy their own coverage. Only 22% of small employers considered themselves well-informed about the coming state-run online health care exchanges. Approximately 6% say they plan to drop health insurance coverage for their employees once the reform goes into effect in January 2014, the survey says. "The health insurance carriers are starting to change some of their health plans now," says Sam Gibbs, vice president of eHealth and president of its eHealth Government Systems unit. "What employers need to do right away is to start shopping around, because there are some new plans -- there's higher-deductible plans and there's the opportunity to add some supplemental insurance products." While approximately 88% of the survey's respondents say they had 10 employees or fewer at their company, the majority of firms say they plan to continue offering coverage for their employees in 2014. The high cost of providing coverage is the primary concern for small-business owners. Small firms feel in a bind, since offering health insurance to employees is a critical component to recruit and retain talent. More than four in 10 respondents say they also feel a moral obligation to provide health insurance benefits to their employees, according to the survey. According to the survey, more than three-quarters of the respondents say they spend more than $200 per employee per month on health insurance premiums for employees and their dependents. Of those, 23% say they spend upward of $500 per employee per month, eHealth says. On the flip side, small firms are asking employees to contribute a nominal amount, with the majority saying employees contribute less than 10% toward the cost of health insurance premiums. To get expenses down, 74% say they would consider raising employee deductibles or making accident and/or critical illness insurance an optional benefit. More than half of the respondents (58%) also say they would consider dropping benefits such as dental or vision to keep health insurance coverage for their employees. Approximately 23% offer wellness programs or other ways to encourage workers to stay healthy as a way to reduce health care costs, the survey says. 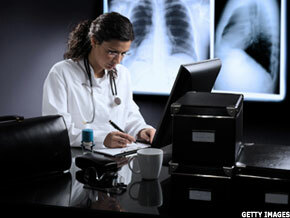 Small firms are largely unaware of the potential effects of health care reform, a survey says. One option being weighed right now is to give employers the option of a so-called defined contribution plan, Gibbs says. "Today if I'm a small business employer I get a health insurance plan in which I pay a percentage of the premium and so every premium is different -- older people are higher, younger people are lower and so instead of paying different amounts for different people ... as the employer I can set a fixed price for how much I am going to pay for my employee," he says. "Let's just say it's $300 a month. I am going to give every employee $300 a month. Then the employees will be able to go on the exchange and buy a plan, and if the plan cost more than that, then the employee can pay the difference," Gibbs adds. "Those are some of the bigger changes that are going to happen giving small business more choices on how to pay for health insurance in 2014." The survey was conducted between Feb. 10 and March 13 with 236 small-business customers of eHealthInsurance.com. The respondents answered anonymously.